It’s the most wonderful time of the year! Time to cuddle up with warm mugs of hot cocoa and watch your favorite Christmas movies with the ones you love the most! Don’t leave your friend out of all the love and good cheer! 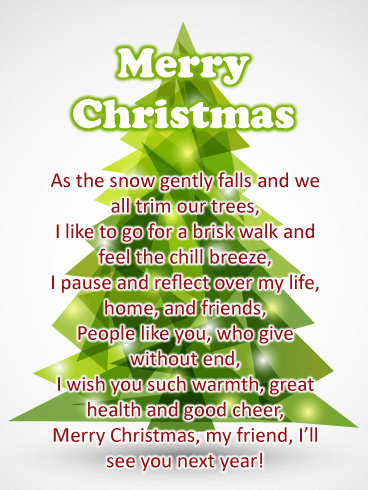 Send them this quaint Merry Christmas card with a poem wishing them the best this holiday season! When it comes to best friends, you hit the jackpot! Life is always better when you two are together. You have so many fond memories of talking to them until late at night, going to parties with them, maybe even building snowmen together! 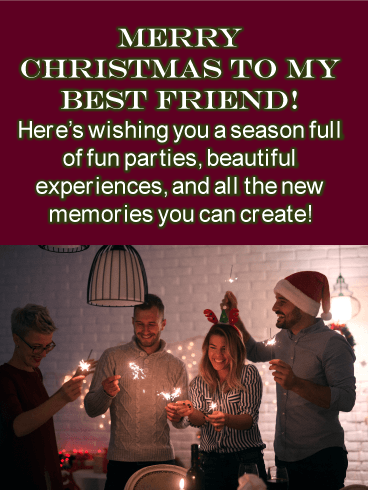 Even if you aren’t able to see each other this holiday season still send them some love with this Merry Christmas card! Nothing says Christmas time quite as well as a festive, holiday sweater! 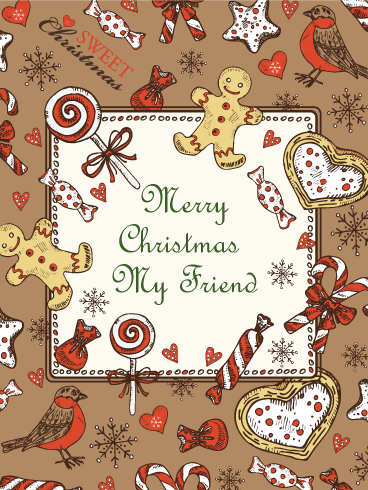 Red, white, green, prancing reindeer, trees, and snowflakes decorate this cheery card. 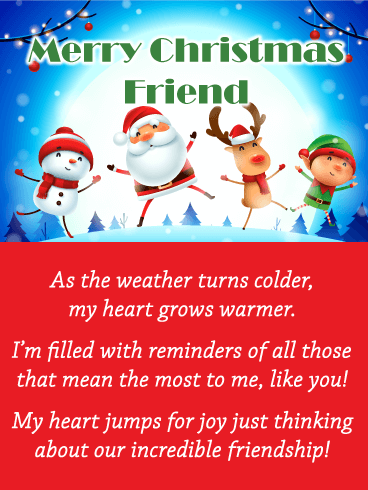 Send this cozy Merry Christmas wishes card to your beloved friend to put a big smile on their face. Your friend makes your life so much more special every day of the year. This is the Season to spread love and joy! 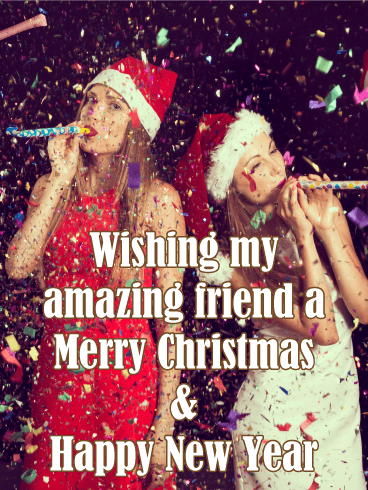 Grab your Santa hat or reindeer antlers cause it’s time to raise a glass in cheers to your incredible friend! A heartfelt toast makes for a special moment at any gathering among friends. 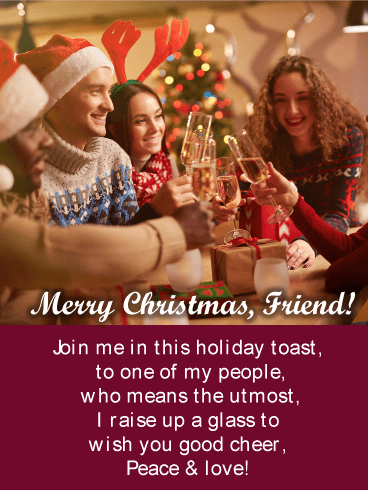 Now you can send your friend their own sweet toast with the Holiday Party Merry Christmas Card. Send them good cheer and wish them peace and love with this photo card! There is no present like the gift of presence. 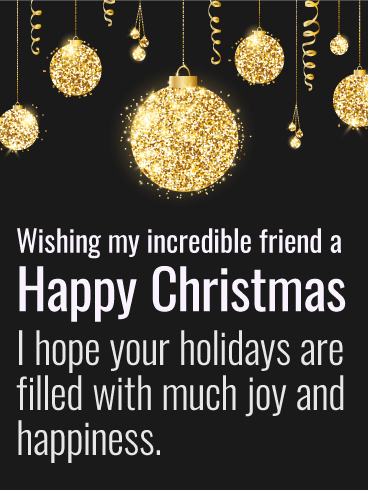 Send this glittery Presents Under the Tree Christmas Card to your awesome friend. Whether you two will see each other this holiday season or not, this card will warm their heart. The jubilant and jauntily wrapped packages placed with care, under sparkling lights, will communicate your gratitude for the warm and thoughtful gift of their friendship. You might gather around the Christmas tree with your family, but it’s your friend you share cookies recipes with. Your friend you show off your new snowman too. And your friend you shovel snow with. 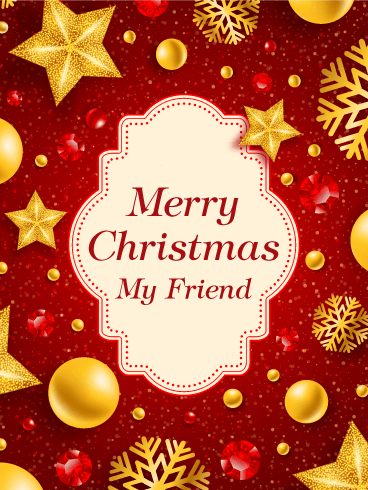 Christmas might be for family, but the days surrounding it are for friends. 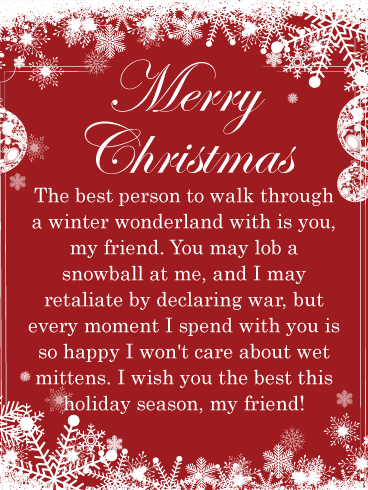 So wish your friend the most merriest of Christmases with this sweet card. 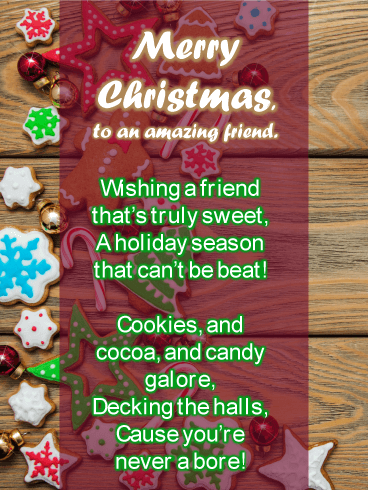 Santa might be responsible for bringing gifts to the good girls and boys one day a year, but your friend has gifted you with laughter and support all year round. 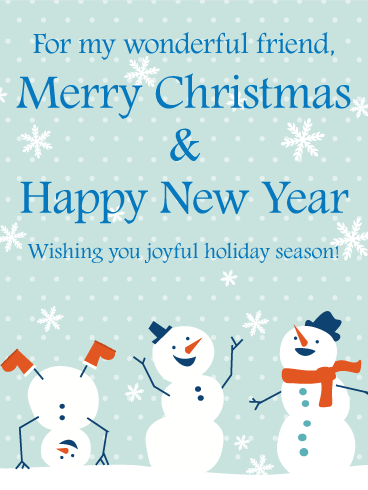 Tell them thank you and send back a gift of good cheer with this wonderful Christmas card. Dolls and trumpets are nice, but what everyone really needs is friendship to fill them with the holiday spirit. There's magic in the air this Christmas! Whether you have snow or not, the air still sparkles with goodwill and merriment, making it hard not to smile. Filled with Christmas wishes for good cheer, these dangling ornaments are ready for the holiday. 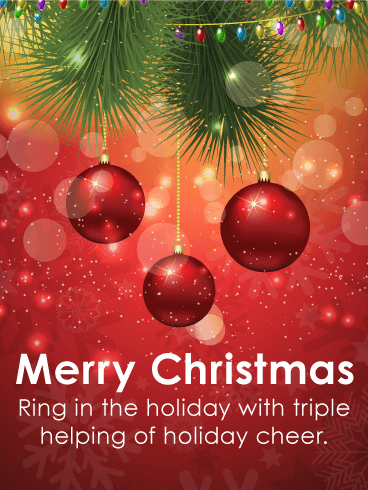 Share the Christmas spirit this year with your friends and family by sending along this festive Christmas wish. Who needs five golden rings when you have one that sparkles like this gorgeous Christmas wish? This Christmas card hums with festive cheer, all the magic of the season woven together into this beautiful ring. 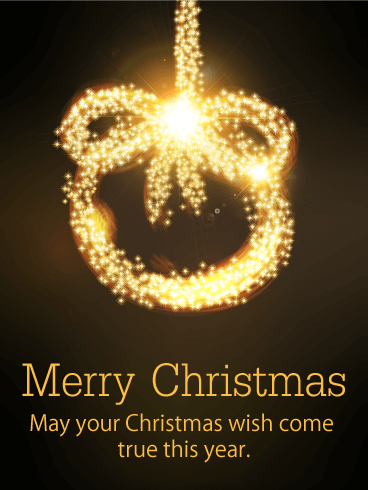 With it, you can lend power to a Christmas wish, so make sure you send this card to someone special. Are your friends so close that you consider them family? Do you want to let them know how amazing you think they are? 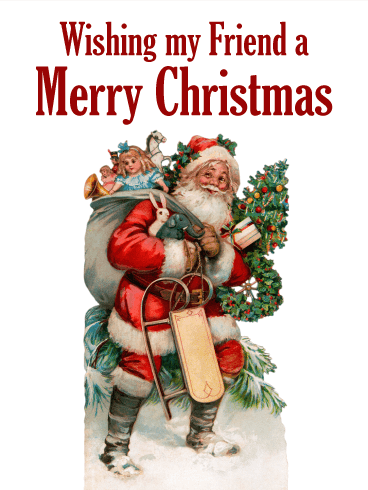 Then send this Christmas card to start your holiday celebrations! 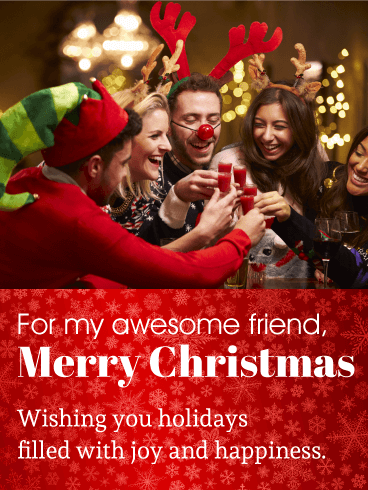 This Christmas card shows a couple of friends having a fun holiday celebration - just like the party you will have with your friends! 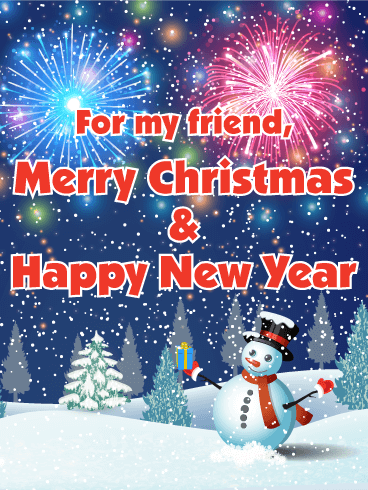 Make this Christmas and New Year's the best ever with this Christmas card! Snow, icicles, and cold weather are easily recognized as part of the Christmas season, but many people would rather spend the holidays in a warm, sunny place. 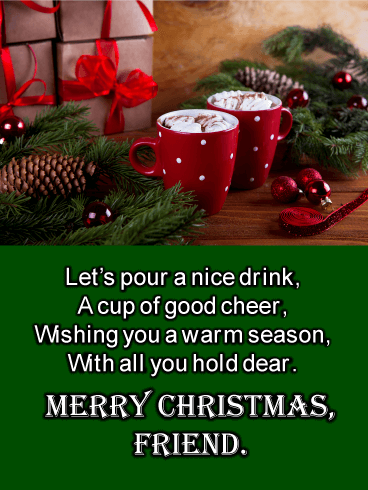 To add a bit of fun and humor to your friends' holiday celebrations, send this Christmas card to everyone you know! 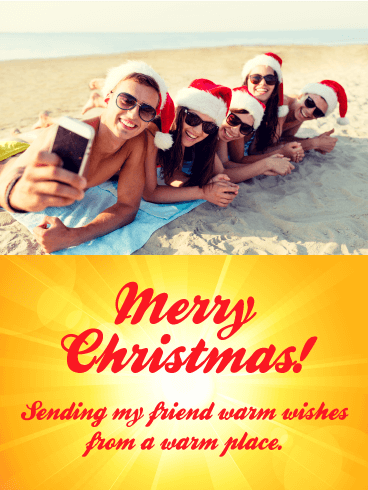 The beach-themed picture and silly message will make this a Christmas they will never forget! No matter your age, the holidays are the perfect time for a party! If you have a friend who loves to play loud music, dance, and celebrate with abandon, this Christmas card is the perfect gift to send to them! 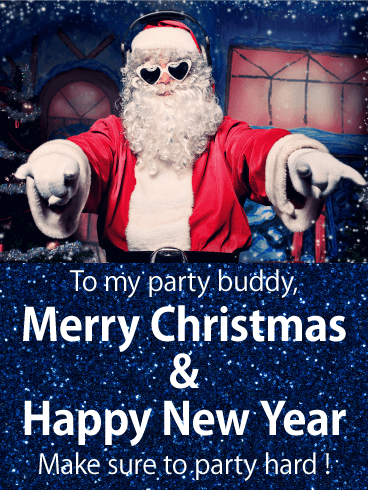 The rock-and-roll DJ Santa, glittering designs, and fun Christmas wishes will make this the best holiday season ever! Friends are a precious and important part of everyone's lives. These special companions offer support, love, and strength through all of life's twists and turns. 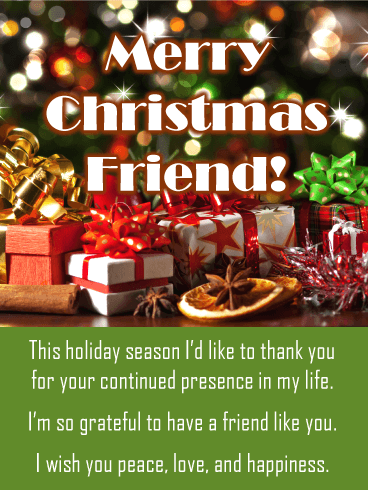 As the holiday season approaches, use this Christmas card to show your appreciation and love for your friends. 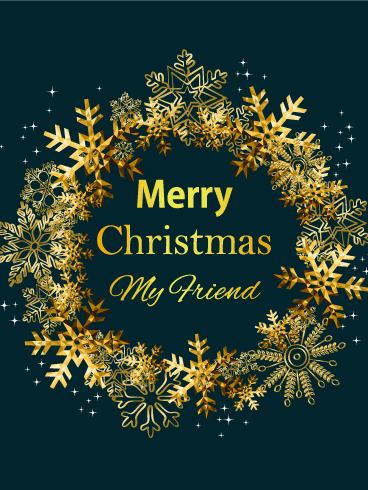 Let the beautiful golden wreath and shining snowflakes say "Merry Christmas" and demonstrate your affection for your closest companions. 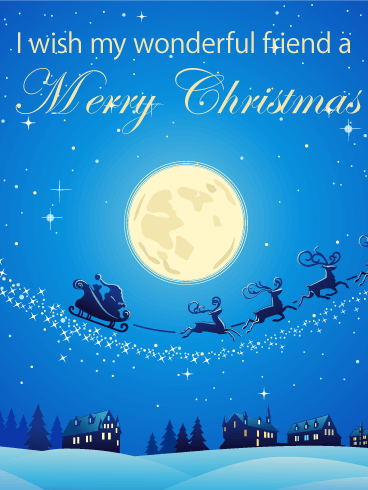 Send this gorgeous Christmas card today! Friends. They are the people that always have your back and the first people you call for both good news and bad. Friends are the family you get to choose. 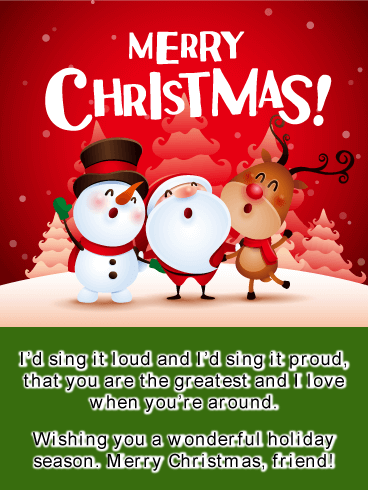 To show your friends how much you love them this holiday season, send this Christmas card to celebrate! The fancy design will show how much you value their friendship and the sweet gesture will show how much you care. Christmas is for sharing affection through gifts and gestures. 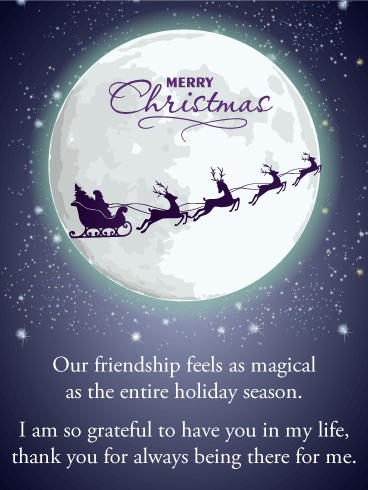 As the holiday season approaches, show your love for your friends by sending this Christmas card as a gift. The sweet message will show how great you think your friends are and how much you appreciate their friendship. If you want to wish your friends a happy holiday season, this is the right Christmas card for you! For many people, their friends are close enough to be part of the family. They are there for the high points and supportive in the hard times. No matter the celebration, these friends are always special and important guests. 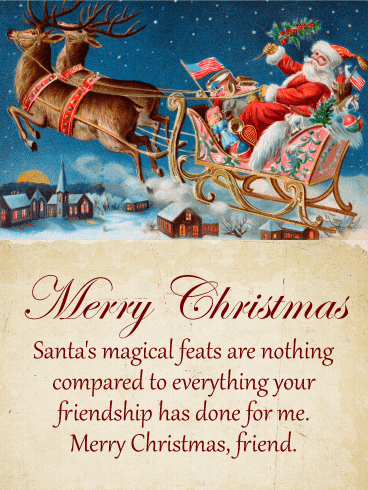 If you have a friend that is close, wonderful, and important, use this classic Christmas card to send your holiday greetings this year!